As the new year approaches, I begin to reflect on the past year. I ponder the things I learned and what I would do differently. As I look back some memories are blurry or fuzzy. While other memories stand out and are noteworthy. This year I took many risks and made a big investment … in my dream. Do you ever wonder where dreams come from? Why we desire the things we do? What makes us interested in one thing more than the other? Where our passions and desires come from? Why we love what we love? God made us this way. He gives us our gifts, passions, desires, and dreams. God is a creator and master artist. God is the first and best selling author for eternity. God made you and me to be who we are. He knew us before we were formed in our mother’s womb. (Psalm 139:13) How awesome is that? Friends, I can not stop praising Him; for His goodness, His mercy, His salvation, His compassion, His forgiveness and His generosity. As I look back and reflect on 2012… all I see is His signature upon my life. How can I think about me, when all I want to think about is Him? If it wasn’t for Him, I wouldn’t be where I am today, doing what I’m doing right now. A lot of you don’t know where I’ve come from and where I’ve been. If I were to tell you, I believe you would start praising Him too. He is my inspiration. He is my everything. I look back on this year and on my life and all I see is His faithfulness, love and goodness toward me. I can’t help but praise Him and pour out my heart with thanksgiving and appreciation. May He receive all the glory. I thank Jesus for all He is doing in my life. He is real. He is everything the Bible says He is. He makes dreams come true, because He is the author of them. This song “Brand New Me” by Alicia Keys reveals a little bit about me. Thanks to Jesus, I’m a brand new kind of me. I am grateful to Jesus this year. What are you grateful for? Today I am guest posting at my dear friend and gifted writer Christa Sterken. I met her at Jeff Goins TribeWriters course. She came up with a wonderful concept of doing advent guest posts reflecting thoughts on Christmas. Please visit her website and read what Christmas means to me. A bestselling author goes behind the lens of a legendary photographer to capture a magical time. A consummate photojournalist, Stanley Tretick was sent by United Press International to follow the Kennedy campaign of 1960. The photographer soon befriended the candidate and took many of JFK’s best pictures during this time. When Kennedy took office, Tretick was given extensive access to the White House, and the picture magazine Look hired him to cover the president and his family. Tretick is best known today for the photographs he took of President Kennedy relaxing with his children. His photographs helped define the American family of the early sixties and lent Kennedy an endearing credibility that greatly contributed to his popularity. 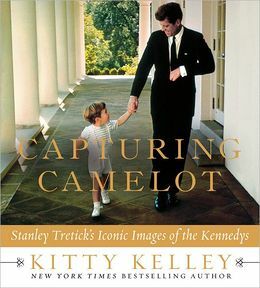 Accompanied by an insightful, heartwarming essay from Kitty Kelley—Tretick’s close friend—about the relationship between the photographer and JFK, Capturing Camelot includes some of the most memorable images of America’s Camelot and brings to life the uniquely hopeful historical era from which it emerged. 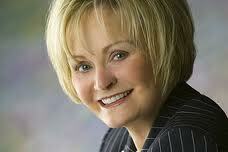 I had the pleasure of meeting Kitty Kelley at the BEA Blogger’s Conference in June. She was one of the authors who sat at my table to discuss her new book Capturing Camelot. When she started to describe her book, I was taken in by her gift of storytelling. I became intrigued by Capturing Camelot. When St. Martin’s Press reached out to me to review Capturing Camelot, I was beyond thrilled. I couldn’t wait for the book to come in the mail. I rarely say this in my reviews, but this book is beautiful. I absolutely loved it. Kitty Kelley does a extraordinary job of drawing you in, much like she does in person. You are taken back in time where you imagine what life was like for John F. Kennedy and his family. The photojournalist, Stanley Tretick (who was Kitty Kelley’s best friend), took exquisite photographs of the Kennedy’s. He was an incredibly talented photographer. He captured amazing moments with photos as Kitty Kelley does with words. I would define Capturing Camelot as a tribute of sorts. A tribute of her best friend Stanley Tretick and of our 35th President of the United States, John F. Kennedy. Capturing Camelot is a “keepsake” of never-before-seen photos and a poignant story. I highly recommend this book. In conclusion, I want to thank Kitty Kelley and St. Martin’s Press for sending me a complimentary copy and allowing me the privilege of reviewing such a beautiful book. KITTY KELLEY is an internationally acclaimed writer, whose bestselling biographies focus on some of the most influential and powerful personalities of the last fifty years. Kelley’s last five books have all been number one on The New York Times bestseller list, including her latest, Oprah: A Biography. 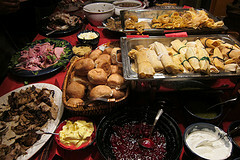 When I was growing up, giving looked like a table full of home made food. My family toiled at making delicious dishes while I delighted in the aromas that filled the house. Now that I’m older and have a family of my own, I try to emulate my family’s tradition. My father is a chef. He grew up in a poor fishing village. As a child he suffered terrible hunger and poverty. He would always tell me stories about his childhood. How there was no food and many times he would go to bed hungry. I learned about poverty through my father. I grew up privileged in the sense that I had a roof over my head, food to eat and clothing on my back. Cooking was an act of giving in our home. My father grew up not having food, so he always made it a point to feed the homeless. He never forgot where he came from. My father’s life and example taught me to be compassionate toward others in need. Which is why I love supporting organizations like Compassion International. They are doing a wonderful work helping children in need. Right now, they are having a campaign to raise $20,000 for children living in poverty. If you would like to sponsor a child or donate to the Compassion International Christmas Catalog, please click here. What does giving look like to you? Like all epic road trips, Shawn & Maile’s story covers as much interior mileage, from one state of mind to another, as their big, blue bus does the physical miles across the United States. This book is many things: a travelogue, a parenting manual, a spiritual narrative. But most of all, it’s an engrossing tale told by two wise and thoughtful writers. Don’t read it if you’re not prepared for the oncoming wanderlust. – Jason Boyett, author of “O Me of Little Faith” and “Pocket Guide to the Afterlife”. 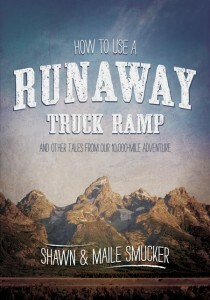 I read How To Use A Runaway Truck Ramp slowly and deliberately like savoring a delicious meal. This story is such a delight. I enjoyed getting to know this family as they embarked on an adventurous road trip across the United States in a big blue camper bus called Willie. In the book, Shawn and Maile took turns narrating their perspectives of this adventure. There were ups and downs as they shared which left me either thinking or on the edge of my seat. What a treat it was to read their cross country adventure. They both equally write beautifully. Their story is honest, heart felt and genuine. I highly recommend How To Use A Runaway Truck Ramp. I haven’t read a story quite like it and I’m sure I never will. I guarantee you will love reading their story. If you don’t already, I would also recommend you follow their blogs. I can’t wait for their next book. Maile and Shawn live in Lancaster, PA with their four children. Shawn is the author of Building a Life Out of Words and blogs daily at shawnsmucker.com. Maile blogs at mailesmucker.blogspot.com. I have the privilege of guest posting for Tim Allen today for his 12 Days of Guest Posts Christmas series. I wrote about my impromptu meeting of someone very special. Please visit his website to read more. I am a contributing writer for Godly Writers and today I write about the struggle for every writer… Resistance. I struggle with the voices which tell me I’m not a writer and that I shouldn’t bother. I have been especially thinking about resistance after reading two of Stephen Pressfield’s books; The War of Art and Do The Work. To read more, please visit Godly Writers. This week while walking to catch my bus after a long hard day of work. I noticed something folded on the dirty asphalt street. I looked down and discovered it was a twenty dollar bill. I stuck it in my left coat pocket and ran to catch my bus. The following morning I was commuting back to work and reading a book I am reviewing. The author was discussing how he struggles with giving money to the homeless. He felt as a believer, he shouldn’t hold back in giving to someone in need. I felt convicted because I thought about how many times I pass homeless people on the streets of Manhattan and don’t give anything. I hesitate because like the author, I tend to think they will just spend it on alcohol or drugs. However, I realize when I give, I’m giving unto the Lord. What they do with the money isn’t really my concern. God knows and that’s all that matters. I got off the bus and walked my usual route to work. However, this time while I was walking, I see this young teenage girl sitting on the cold concrete sidewalk with a sign saying she is homeless and needs thirty dollars by the end of the day to sleep in a motel. 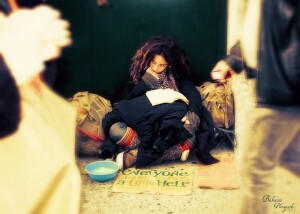 What struck me about her was that she wasn’t the typical homeless person. At least, not the ones I have come across on the streets of New York City. She was young, dressed in clean clothing and reading a book. She was different. I walked past her. 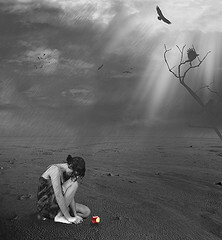 Until the Lord brought to my remembrance what I read on the bus and the twenty dollar bill stuck in my coat pocket which I had completely forgotten about it. It struck me odd that I would find a neatly folded twenty dollar bill in the middle of the street on a busy intersection during rush hour. I wondered why I was the only one who saw it. God knew I would be passing this homeless girl and wanted me to give her the money. So I quickly turned around and walked back to her. As I handed her the money, I told her I found it on the street last night and Jesus wanted me to give it to her. She thanked me and I continued on my way. I could have missed it, but thankfully, the Holy Spirit gently reminded me. This incident made me think about the meaning of Christmas. I believe the true meaning of Christmas is about giving to those in need. Those who are less fortunate, especially the children. Which is why I blog for Compassion International. I believe in what they are doing in helping the poor, hungry and homeless children around the world. Won’t you join me in helping and giving to children in need? Please click here to see the ways in which you can help a child this Christmas season. Building on the themes in his popular book When God Winks, SQuire Rushnell shares real-life stories that are certain to uplift and encourage you. The stories in this book reaffirm that godwinks happen to everyone. We just need to learn how to see them, allow them to unfold, and accept them as direct, person-to-person communications from God to each of us. As you’ll see, those so-called coincidences that you’d been dismissing so easily really do mean something. And you need to pay attention. They are like unopened gifts that have been placed upon your doorstep. You will be amazed to read how every joy, every hurt, and every worry that happens to you has already been written about in the Bible. 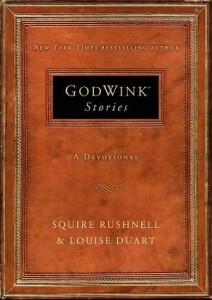 Godwink Stories simply draws upon the parallel between the stories of real people and God’s wisdom in the scriptures. Godwink Stories can be read in various ways. You can read the book cover to cover. Or follow along each week for a year. It’s also perfect to read for a pick-me-up story that fits your need of the day. Whether you’re looking for encouragement in a time of need or a story that speaks of joy, there’s a godwink story just for you. Isn’t Godwink Stories a great title? Just by the title alone, I wanted to read this book. I was pleasantly surprised. I laughed and cried through this heartfelt devotional. I was moved, inspired and encouraged by the stories. The stories are basically letters from people like you and I who had, what I refer to as a God moment. Godwinks are moments where God shows up miraculously in someone’s life. The various chapters in this devotional are filled with stories which will leave you spiritually encouraged, invigorated and refreshed. I was especially touched by Chapter 3 entitled Angels, Chapter 4 entitled Prayer Encouragement and Chapter 52 entitled Love Times of Sorrow. These stories made my cry. I believe Godwink Stories will make an excellent Christmas present. I highly recommend this book and believe this devotional will be an encouragement to many. In conclusion, I want to thank Howard Books for sending me a complimentary copy of this book to review. SQuire Rushnell, a former television president and CEO, was for twenty years an executive with the ABC Television Network. Father of such programs for young people as Schoolhouse Rock and the ABC Afterschool Specials, he also led Good Morning America to the #1 spot. Author of the word-of-mouth phenomenon When God Winks, SQuire lives in Martha’s Vineyard with his wife, Louise. Louise DuArt, one of the world’s top comedic impressionists, has costarred with comic icon Tim Conway in a national touring show for one and a half decades. In starring roles on Broadway and in her eight-season talk show on ABC Family, her roster of 100 characters ranges from Judge Judy to Barbara Walters, Bart Simpson to Barbra Streisand. Louise has toured as a speaker with Woman of Faith, and performs with her husband in Three Couples, a life-changing evening of music, inspiration and comedy. With SQuire, she coauthored Couples Who Pray, a breakthrough book encouraging partners to take The 409 Prayer Challenge. I have the sincere pleasure of introducing you to my dear friend and gifted writer, Andi Cumbo. I met Andi on Twitter almost a year ago and recently in person at the Quitter Conference. She is as amazing in person as she is on line. She is my friend, teacher and mentor rolled into one. I have learned so much by taking her writing classes which I highly recommend. Her classes have stretched me as a writer. Today, Andi Cumbo visits to share her dream which birthed her beautiful book, God’s Whisper Manifesto: Makings of a Dream. You can purchase her book at Amazon and Barnes & Noble. She’s lovely on this hill. Now that the trees have shed their leaves, I can see her as I come north, a blue beacon calling me home. My farmhouse. That possessive pronoun – “my” – was a long time coming. 15 years or more. 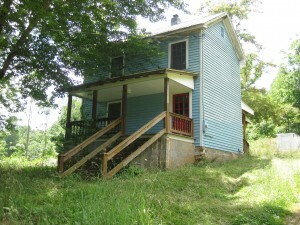 I’ve dreamed of this place for that long – maybe not this blue farmhouse – but the place where I can live this dream – this dream of a small farm where people can come and find rest and sanctuary. Where people can just be completely themselves, no pretense, no pretending. Just a safe place where rest is one of our top priorities. Now, as I sit here with my Christmas tree sparkling on a chilly December night, it feels both so normal and so impossible that I am here in my dream, not imagining but living it. We are just in the beginning here at God’s Whisper Farm. We don’t have my big garden yet, and the fencing isn’t even up for the goats and alpacas I will have wandering the pasture and hill. The timberframe that will become, in time, the center of this place has yet to be built, and our outdoor amphitheater still needs to be carved out of a wooded hillside. But this little blue farmhouse – Nellie is her name – she reminds me with every glimpse that dreams become life if we just let them live. Andi Cumbo is a writer, editor, and writing teacher who lives in the mountains of Virginia. Her first book God’s Whisper Manifesto: Makings of a Dream has just been published and shares the vision of how life will happen on her farm. You can read her (nearly) daily posts and get more information about her work on her website – andilit.com. There are times I feel trapped, bogged down with responsibilities and obligations. There are people I love who are depending on me. I can’t let them down. I can’t make a mistake. We need an income to keep a roof over our head, food in our stomachs and clothing on our backs. Lately, I’ve been thinking about how much of my time is given to a corporation. How my life really isn’t my own. How my time is given in exchange for a paycheck. Don’t get me wrong, I am grateful for a good job. I’m not complaining. I’m just facing where I’m at in life. Who knows, I may even be going through a midlife crisis. I’ve been ruminating on past regrets. In that, I chose a steady income instead of pursuing my dream. Granted, things could be worse (and they have been). However, there are those whom are not afforded the ability to ruminate, because all they do is work to feed their kids, barely making ends meet. So… in the grand scheme of things, I am considered blessed. But right now, I’m not talking about my job, I’m talking about a dream. My friend Andi Cumbo wrote a thought provoking blog post entitled “To Quit or Not to Quit” which sparked this post. A long time ago, I quit acting and singing. Why? For the very same reason I mentioned above. A job. A steady paycheck. I sold out and forfeited my dream for the illusion of security. I can’t express how bad of a decision that was. Which is why I’m proactive in reminding my sons to pursue their dreams and do something they love. If you do what you love, then you don’t mind working twelve hour days. You will be investing your time doing something you believe in and are called to do. This goes beyond simply working to get a paycheck. When you work a conventional job, there are no guarantees. You can be there today and gone tomorrow. You can be offered benefits one day and then it be taken away the next. In this day and age, you can’t invest in a job or put all your eggs in one basket. You need to invest in yourself and in your dream. Dreams come from God. When you work toward a dream, it’s yours for keeps. No one can mess with it or take it away, unless you let them. So yes, I live with regrets and admit I’ve made some pretty bad mistakes. But does that mean it’s over for me? Should I just give up, throw in the towel and call it a day? No, I’ve already done that, and all for the wrong reasons I might add. I’ve made some mistakes, so what, you’ve probably made some too. We all do. But should that mean it’s the end of the world? This is not our final chapter in the big book called life. I feel like God is giving me a second chance … so I’m priming up for 2013. I may have given up in the past, but I’m not now. I’m going full steam ahead, no matter what. Do you believe your dream isn’t attainable? Do you feel hopeless and want to give up?